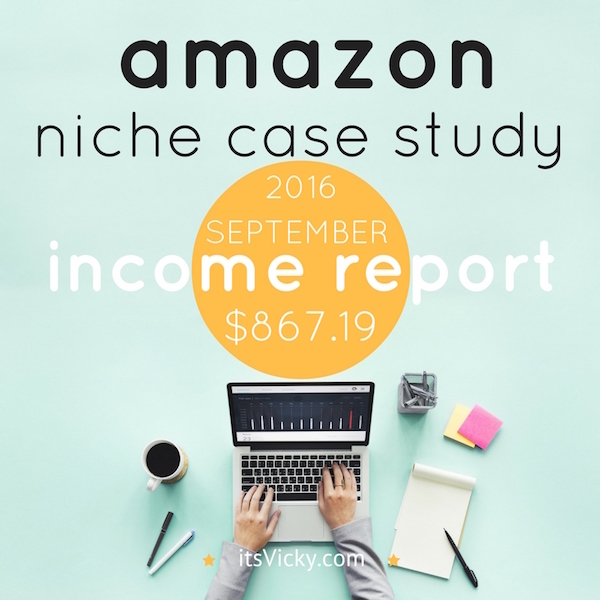 September has come to an end and it’s time to summarize the amazon niche site case study. September has given us some increase and some drops, but with the highest item sale yet, I like where this site is going. Niche site in the health niche. The site is based on outsourced content that’s submitted on a regular basis. The site should be a hands off site that will grow organically over time. The site is monetized with Amazon products only. Sub-niche 1 and 2 – low ticket items, focused on the winter months, we have great traction and daily sales. Sub-niche 3 – medium ticket items, focused on the winter months, some traction and a few sales monthly. Sub-niche 4 – low ticket items, all year around niche, very little traction and few sales. Sub-niche 5 – brand new sub-niche – high ticket item, all year around niche, very little traction so far, only 1 sale. Trying to get into some niches that will balance out the winter month niches, during the summer months. 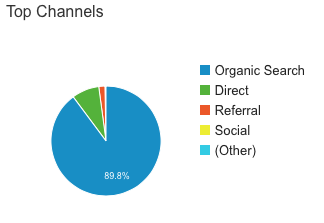 Organic traffic is still the main traffic source of this site. With outsourced content, the site is now starting to rank pretty well for some good keywords. Consistency in submitting content plays a key role. 2-3 articles have been submitted weekly for the last year or so and that is now starting to pay off, with the organic listings. I know I really need to step up the game when it comes to social marketing. Relying on mainly one traffic source is not good, so I need to step up the game here. You can hardly see the yellow pie piece that represents social, sigh. We are now getting into the fall/winter months, which should benefit the site since some of the sub-niches are targeting products with high season throughout the cold months. Here you can see the trend for the first sub-niche. High search volume with a peak in December, low search volume with a dip in July. We do see an increase in both sessions, page views, and users, that’s great. This is a trend that I’m hoping will last. 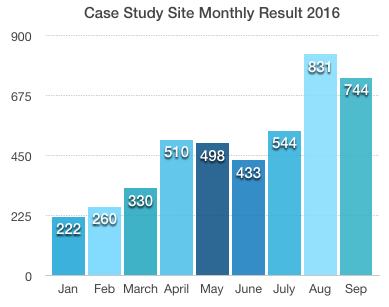 What kind of content from this case study site ranks well and get the most traffic? Looking at the top 10 pages, of the site in Google analytics, the two top ones receive a total of 40.5% of the page views. Both these are “Top List” pages, “Top 5” and “Top 10” pages. This kind of lists works! What other types of content receive a lot of traffic? As you can see it is in-depth, content that provides value to the reader that attracts the readers. Also worth mentioning is that these 10 pages have an average time on page of 3.25 minutes. That is exciting to me. People are reading the content and finding it helpful, otherwise, they wouldn’t stay. Ranking for 4.1K keywords is again, due to the consistency of content submission. With the keyword rankings comes the traffic. When checking the traffic and keywords at SemRush, I also like to check the updates from Google. Have there been any updates or changes in the algorithm during September 2016? Accelerated Mobile pages (AMP pages) – if available these AMP pages will now be displayed when searching Google from a mobile device. This allows for an increase in mobile traffic for corresponding AMP pages. For the user, this means that time will be saved for people searching Google on their mobile. Penguin 4.0 launch – this is now part of the core algorithm, just like the Panda. The Penguin 4.0 is a real-time algorithm. The update eliminates the long wait to recover if a site owner has been penalized. Both of these updates I think will make the internet a better place. Read about my recommended hosting here. Although this is down a little from last month, I do see the potential. I had a high commission sale of $126 for just 1 item. If I can get one of those every day we are heading in the right direction. I’m hoping that the combination of targeting low ticket items AND high ticket items will start to pay off when it does, we will see a great increase in income as well. This site is nowhere near where I want it to be… yet. I do see great potential though and I’m excited to see what it can do during the winter months and the holiday season. Find a new content writer – I was very lucky to have found a great content writer for the site. She was providing excellent content to a great price. She was also a field expert with great knowledge. Well, I guess nothing last forever. Last week, she turned in some let’s put it nicely “bad” articles, copied content that was poorly rewritten. She denied that she had outsourced on her end, but from my point of view, there was no way she could have written that herself… Anyway, to make a long story short, I now need to find another writer for the site. I’m glad I plan ahead and have well-written content submitted to mid-December, but hoping to find a good writer to replace my last one asap. Social media – so this is one of the areas I will have to improve. I know I keep saying it, but I do need to get around to it as well. Social media can be a great source of traffic and get your brand and content out there, so this will have to be priorities going forward. So got some things to work on for sure. I am very excited and can’t wait to see what the site will do in October, November, and December. Don’t miss it, sign up for the “Fridays with Vicky” Newsletter. Catch up with the case study right here! Wow, this looks interesting as hell. I’m currently in the process of building a niche site and this post has just motivated me to keep going. I was a little hesitant on promoting Amazon products since you only get a few dollars each time, but of course when you have more traffic and more buyers the money starts getting a snowball effect whih is something I have never thought of. I can totally understand where you are coming from, I was thinking the same thing for the longest time. So I thought the only really good way to find out if it’s worth it, is to actually try it out and set up a niche site monetized with Amazon, that’s what I did. Although the site is no where close to where I want it to be, I really do see the potential. If you build your site on keyword targeted content, that over time will rank in Google and the other search engines, it will take some time but like you say there will be a snowball effect. Also consider promoting a mix of low ticket items and high ticket items, to both get the volume and the higher commissions. Thanks for sharing an awesome content.I really love that. Thank you for openly sharing your experiences and suggestions …. proof positive that the Amazon market is NOT overloaded …. plenty of room for all to succeed …. provided you put in the needed effort and quality. I tried Amazon too early in the game; because my ‘following’ was not large enough at the time, I was dropped. It taught me a valuable lesson in patience and I truly appreciate that they give you another chance in the future. Many ‘cut you off’ forever. Thank you for your comment. Amazon offers so many products, so many niches and so many angles to promote… there are many opportunities to make money as an affiliate recommending products. Like you say, it will take some effort and time and the content quality needs to be good. When starting out, we all get excited to make money. It can be good though to wait and sign up with Amazon, and to monetize, until you have some traffic. They do give you 6 months to get that first sale, if you don’t have a sale they will like you say drop you. But don’t give up, when you have some more traffic, apply again! Thanks for the detailed posts. Amazon is great and ive been with it nearly ten years. I’ve been making from between 100 to 900 USD depending on the season or luck each month. 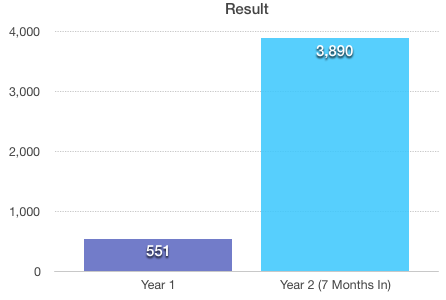 Reason it has not incremental ly increased is I’ve not been consistent. I’ve now changed that practice. Have been working on one of my sites in last two months. Hope to continue. Take what you have learned and the experience from the last 10 years and put that into your site and I’m sure it will do great. Congratulations to your success this far! Sounds like you’ve had a good extra income on the side! Stay consistent and great things can happen! Things doesn’t boom after 2 months, it often has a snowball effect so stick with it!! Let me know how things goes! Yes, I hope to stick with it and work harder. I used to make some good part time money with adsense and amazon, from 2008 to 2012. Then google panda and penguin updates hit some of my sites but didn’t kill them or the income fully. I knew my niche sites and content wasn’t that great, otherwise I might have kept going. But when I saw good, authority sites get hit from those updates and go down, places like the keyword academy of which I was a member at that time shut down, I thought that content website and affiliate marketing would not have a future beyond a few more years. There were also a lot of dire predictions about internet marketing in forums and blogs. I was discouraged. But last year, I noticed some niche sites with through and long articles and reviews coming up in google. Couple of my sites, still make some money, with virtually no new content added for the last 3 or 4 years, I thought to give this my best and see. I still have some doubts. I wonder what future of niche sites will be in say 2025 or so. What do you think? Well written, original content that’s helpful to the reader will rank well in the search engines. There are no secrets… if you are trying to rank with content in the search engines, that’s it. Write great content that are helpful and Google will “reward”you for it. The problem has been that people has tried to manipulate the system and search engines using different black hat methods… The search engines are becoming smarter and smarter and will sooner or later crack down on bad manipulative behavior. The trend that I see, is that great pieces of content on individual sites, will get more attention. Like you say longer in depth articles, reviews, how to’s… are content pieces that rank well because the reader find them helpful. I only see good things coming for the hard working content creator, that creates great in depth, helpful content with the reader in mind! I’m excited for the future, really excited to see where this case study site will go as well. Agree, I have decided to publish only high quality content now. I just removed a load of mediocry posts from one of my old websites that’s still getting some visitors and a sale or two everyday. It had 402 articles. Removed about 150. Look forward to reading your next update. Yes, quality, helpful content is the way to go! Thank you Tara! Glad you found it helpful! I’m very excited though to see what this site can do during the winter months.